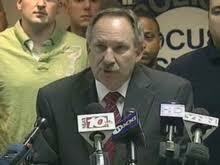 On June 30, 2011, Rochester Indymedia was turned away from a police union press conference at the Locust club. The press conference was called to publicize the police narrative of what happened between Emily Good and members of the RPD on May 12 2011. Members of local media were invited to cover the event. Mike Mazzeo, Police Locust Club Union President, delivered the statement just 3 days after Emily Good's Obstruction Charges were dropped by the District Attorney. His statement is riddled with inaccuracies and attempts to muddle the facts of what is clear in the original arrest video.